It is a beautiful fall day, the kind of day everyone loves — sunny with morning chill. Later, we will be pulling off layers and lightly sweating in the garden. Well, I will be sweating in the garden. Sidney will likely tinker on his car. Lincoln and the girls will play in the woods, with Lucy or the stray kitten the girls found last week. And Sid will drive to the funeral home with his mama to plan his dad’s funeral. That stray kitten has completely undone the steel of my husband’s resolve. Sid strongly dislikes cats. Perhaps I should say that he is indifferent to other people’s cats, but he is opposed to our family owning a cat. We have tried it before, when a friend going through a divorce talked us into taking his cat. It seemed like the least we could do. We couldn’t repair our friend’s marriage or his pain, but we could relieve his concern about his cat. We blinked and the cat’s gestation period passed in that blink. That one cat turned into 18 cats. It was traumatic. We don’t like to talk about it. Plus we realized that taking our friend’s cat was not the least we could do. We could have done less, like NOT take the darn cat. Then this starving kitten hides in our old goat barn, trapped by our dog. It mewed and cried until our girls found it. So, now we are stuck with a cat, because two experienced parents with years of saying “No” did not want to quell the hope in a daughter’s heart. Unless Lucy, our dog, eats the cat, which is a possibility. Perhaps a secret, hopeful possibility for my husband. So today is a lovely day. I have work to do in the garden and lovely schoolwork to do with my children. And I have all these words to describe the weather, our uninvited cat, and the ordinariness of today. But there is this big, gaping hole that I keep pretending is not there. And the important words, the ones that matter most are clogging my heart, clawing their way up my throat until I feel like choking. The words bubble up and leak out my eyes and nose — messy, sticky words that cling no matter how much I wipe them away. Words like father, faithfulness, stubborn, pain, good, love, family, church, grandfather, protector, kind. And even careless. Though that tear-word makes me laugh too. I meant to ask him . . .
And mixed with my congested and disjointed thoughts are flashes of memory — when Louis put my small child on a pony and then walked off . . . without the pony! When he caught a 12-inch long snapping turtle and brought it over because he thought it would make a great pet for 3 yo Sidney. When he brought me a vase of flowers in the hospital after I gave birth to Sidney. When he created chemical explosions for a younger Sidney and Lincoln at the kitchen table rather than outside. When he turned over our bobcat 3 different times, within inches of the whole machine toppling into his pond and Sid had to figure out how to get it out. Perhaps most precious to me . . .after I had Prairie and was sick and not recovering well. He would drop by randomly, sit on the couch in our tiny, cramped trailer, while the 3 older kids crawled all over him. I would sit fold laundry or make bread, while he played with the kids or asked me a deep theological question. Most of the time, he fell asleep, sitting on the couch with kids on him. And it was a comfort to me. There was no pressure. He expected nothing of me. He simply loved me. He came and sat on my couch several times a week because he loved me and he was checking on me. Like I was a daughter. You can be serious with her and say hard things. You can laugh loud and deep. You can be pensive and ponder big questions. And then laugh like loons again. who turns your eyes to your own worth. I pray you can also be that kind of friend. For my friends, I pray that another 26 years does not pass before we meet again, but if it does . . . well, we had our moments together. They were beautiful moments, and I feel heard and understood, my heart is less crooked, and my eyes can see. I have been blessed and the memories continue to bless. **Note: This account is mostly true with a bit of fictionalized tweaks where my memory blurred. But even the fictions are true on many days and might have been true this day. 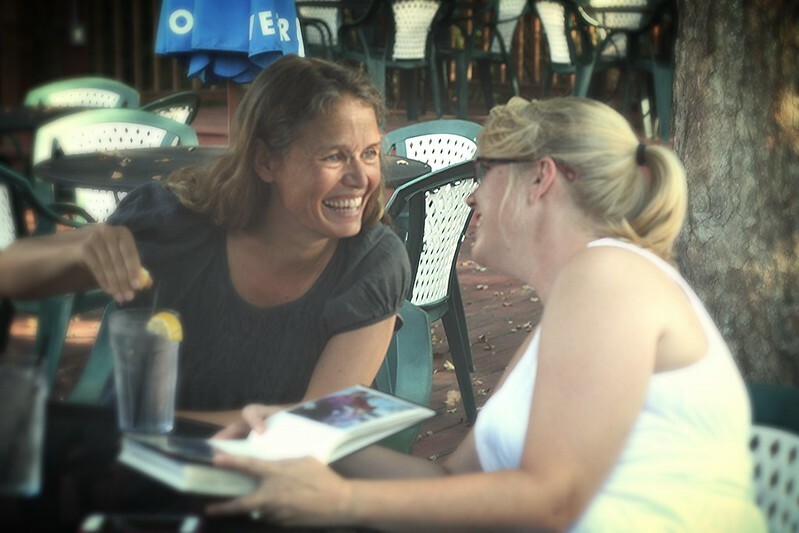 I like for my kids to see that I value writing, to encourage them to write fearless. It is a safe place to be “reckless” as consequences are minimal. So, it is only fair that I should do what I ask my kids to do — write fearless even when uncomfortable. What is the worst that could happen? That you won’t like it, that I won’t like it, I suppose. Nothing to fear there. Summer solstice invited them out-of-doors. It was evening, supper time actually, but for once nobody asked the question — “What’s for supper?” The day’s heat had lifted, clouds swept the sky, and breezy fingers strummed gentle music among the trees and teased her skin. She heard the giggles of a son and two daughters and the squeaky springs of a rusty trampoline. A door thumped shut when her teenage son stepped onto the porch, and the whir of her husband’s saw sounded from the backyard. With the flow of family edging her awareness, the woman dug another hole and plunked a cinnamon-leaved coral bell into place 18 inches from the hosta. Thunder rolled, the breeze kicked, blood danced in her veins, and something called to her. She looked up, wondering if she would finish planting before it rained. The air was electric, molecules buzzed against her skin, filled her lungs — movement and stillness, an expectancy, a held breath. A certainty was coming — her arms, legs, bones, and skin reached toward it. Exhilaration bubbled through heart valves, pumped into her fingers, toes and marrow. Wanting to laugh, she dug another hole, half expecting and hoping the sky to rain absolution and praise on her. She settled a coral bell with burgundy leaves close to another hosta. Her sister had given her the hostas, had dug them from her own yard. This coral bell came from her mom, who gave her a plant every week, claiming she couldn’t care for plants anymore, too much trouble for an old woman. She laid a thick layer of pine needles around her new plants. 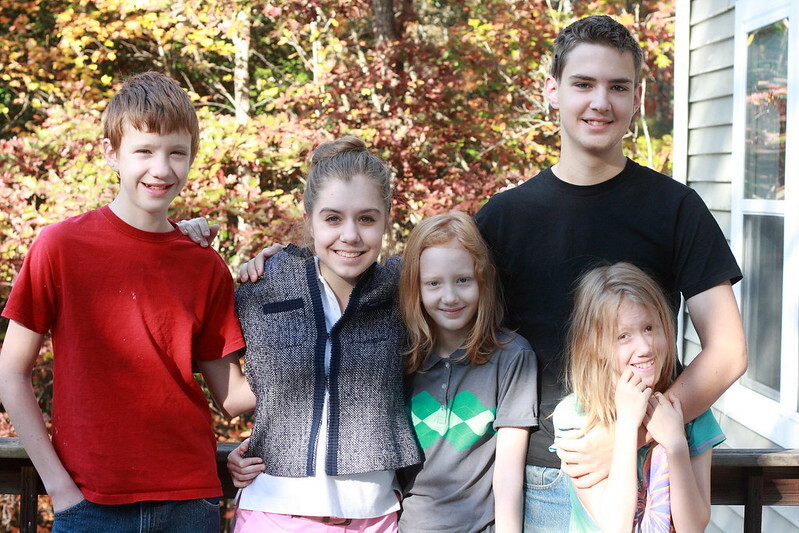 Seven years since they had moved into their house on the hill in the woods. All those 7 years held her longing to plant a flower bed along the front porch, to grow grass in the front yard for bare feet. The woman didn’t miss much from childhood, but she missed the brush of grass on bare feet, especially dew-kissed grass on a cool spring morning. The grass, too, waited almost 7 years, due to finances, poor health and because it took time to learn how to grow tender living things in hard red clay. It had been harder than she had imagined, and year after year, her yard had remained dry, hard, rough and painful to exposed soles. Her patch of earth still didn’t grow the lush grass of her original dream, but it was mostly covered with soft, green growth — clover, plaintain, unidentified weeds and grass — and she was content. This year, honeybees gathered nectar in her yard. Her daughters flitted across the soft green in bare feet, wearing their older brothers’ play cloaks, cloaks too small even for their 9- and 11-year-old frames. But the girls didn’t care, their imaginations making the cloaks what they wanted them to be. The woman exhaled. The certainty broke over her, and she grasped it, pulling it inside her — my dream, I am living my dream. She heard her husband’s hammer, building her bench. She saw her older son tinkering under the hood of the car, while her daughters and middle son carried sticks and imaginary worlds. They were all here, her family, together, home. With the gift of a few extra minutes added to their day. Sidney, my 16 yo son, took the SAT several weeks ago. In preparation, he looked up SAT essay prompts online and wrote timed essays. It probably comes as no surprise that the essay prompts left him groaning. One prompt, in particular, left him feeling that he had absolutely nothing to say on the matter . . .
Is it more courageous to show vulnerability than it is to show strength? Honestly, when I first read that prompt, I cringed too, unsure how to coach him on that one. SAT takers are advised to include examples from their studies and own experiences to support their essay thesis. At the tender age of 16, Sidney had given little thought to showing vulnerability vs showing strength and his short life has given him little experience with either. After a moment or two of thinking about vulnerability and strength, a clear image formed in my mind — 94-year-old Grandmother Louise, my husband’s grandmother and Sidney’s great-grandmother. She, more than anyone else I could think of, is the epitome of a courageous vulnerability. 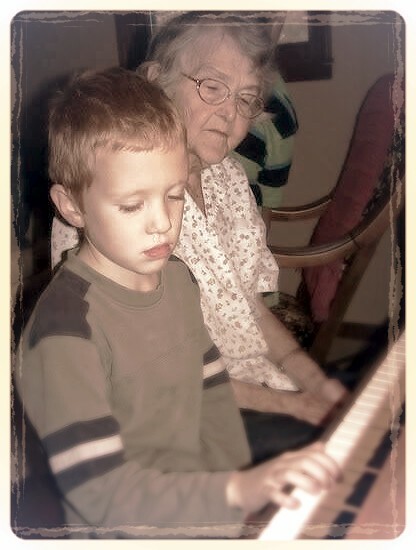 A younger Sidney and Grandma at the piano in her most recent home in North Carolina. She loved to play and sing, even more so when others played and sang too. She buried her dear husband and 3 adult children. At the age of 80, this tiny fragile woman hopped on a plane to Tokyo to visit another son. At 86, she moved from her flatland home in Kansas to the mountainous landscape and curving roads of North Carolina. 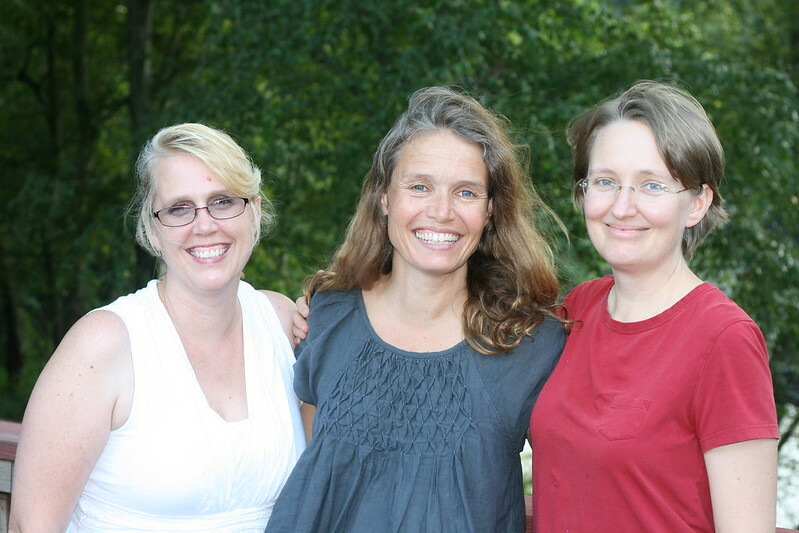 This move brought her to live with a daughter and son-in-law who could care for her. She gave up the independence of driving and exchanged her church denomination for her daughter’s church. Her willingness to give up her old life and habits, to bring herself under the care of another was an admission of vulnerability, her need for help in living. 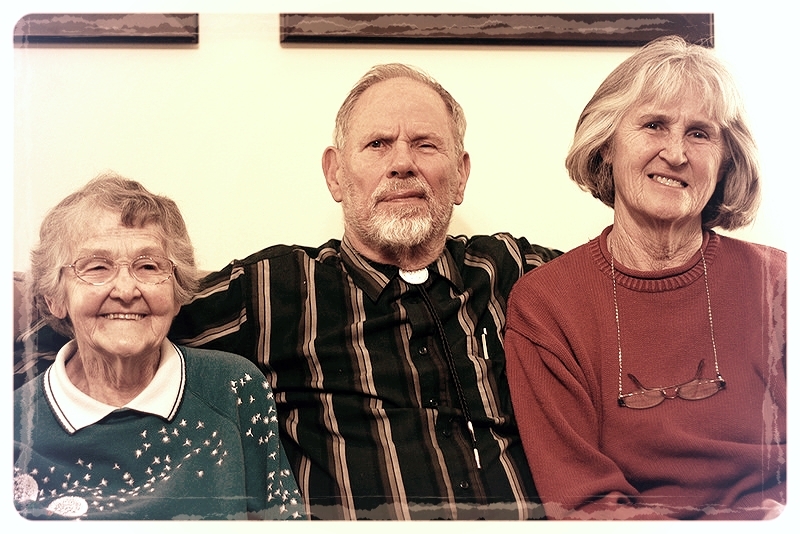 Grandma Louise’s quiet acceptance was graceful, courageous and even joyful. Perhaps her embracing of joy was the most courageous part of her life. 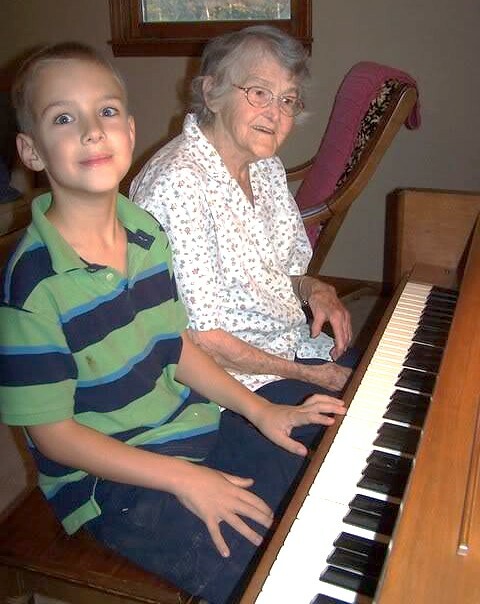 A younger Lincoln plays piano with Grandma in North Carolina. The kids often played for her when they visited. Grandma’s feet could only shuffle across the floor, but her crooked, stiff fingers still danced across the piano keys. For the last 8 years, Grandma Louise lived next door. It is an easy walk through the woods and donkey pen to my inlaws’ home, where she lived. She never once walked the path through the woods to our house — the uneven ground a threat to her balance and breakable bones. Eventually, she exchanged her cane for a walker. 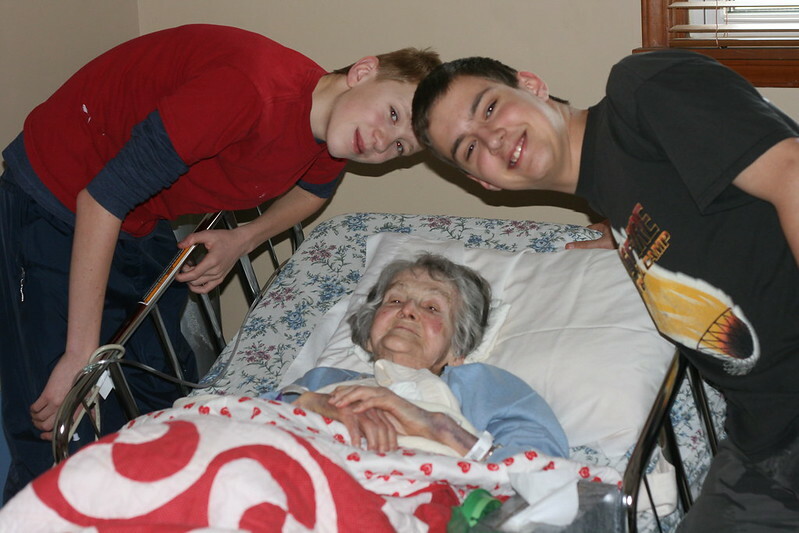 Hers was a quiet, scheduled life of meals, medications, shopping on Fridays, church on Sundays. She could have withdrawn from the world into depression or apathy. She could have become bitter as the people she loved died before her, and little by little, she lost strength, ability, independence, hearing and memory. 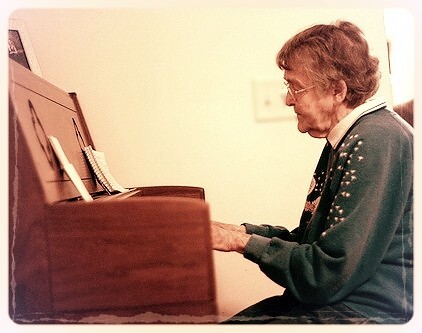 Grandma plays piano at Sidney’s home recital in 2009. Instead, she actively participated in the lives of her family far and near, in the small ways that she could manage — sending birthday cards to children, grandchildren and great-grandchildren — all 78 of them. Although her necessary schedule of meal, meds and multiple bathroom trips complicated life, she was always ready to shuffle to the car with her walker and travel 4 hours, 8 hours, 10 hours away to visit family. Grandma saves the day and the music recital! She abandons her walker in front of the baby grand piano to entertain the residents of a nursing home while we waited for some late-arriving music students. Year after year, she faithfully came to birthday parties and music recitals. 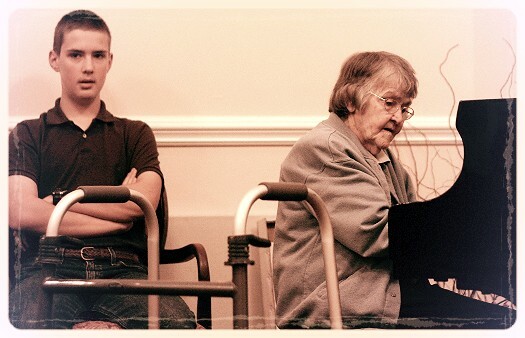 She patiently sat, observing her loved ones around her, trying to hear our words and understand our lives. Grandma sits beside Knocker at the Gaskins’ Thanksgiving 2009. She fully lived the limited life she had. She laughed loudly and girlishly at our lame jokes, clapped her hands when we played the piano or cello. She delighted in our baby goats. She patiently listened to complicated explanations of technological “magic” — her amazement with digital cameras and the internet never waned. She encouraged us, smiled at us. 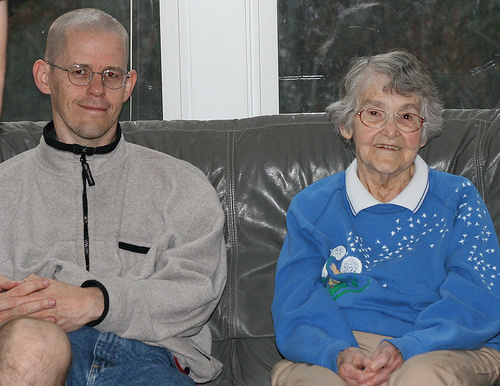 Grandma sits with her son-in-law, Louis and daughter, Sandy at a Gaskins’ Thanksgiving 2010. Quite simply, she did little more than take joy in our presence. 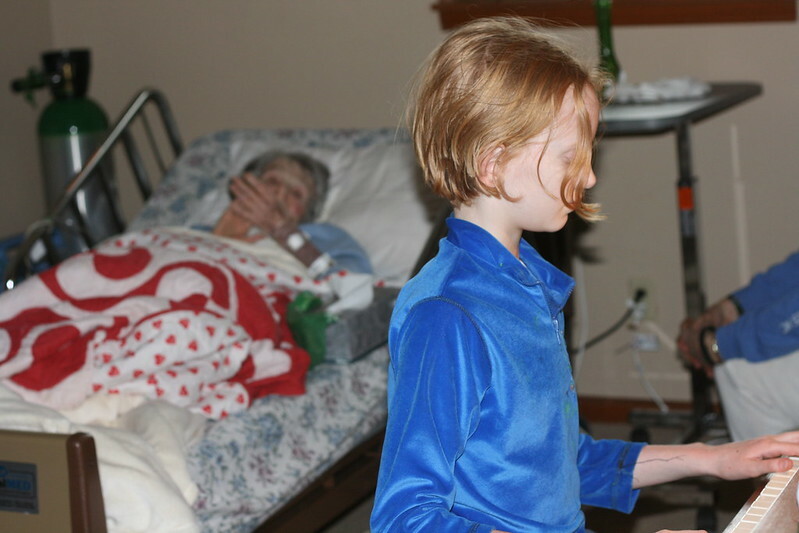 Prairie plays the piano for Grandma in her last days. When Grandma Louise could no longer swallow food and water and the only alternative was a feeding tube, she came home to die. 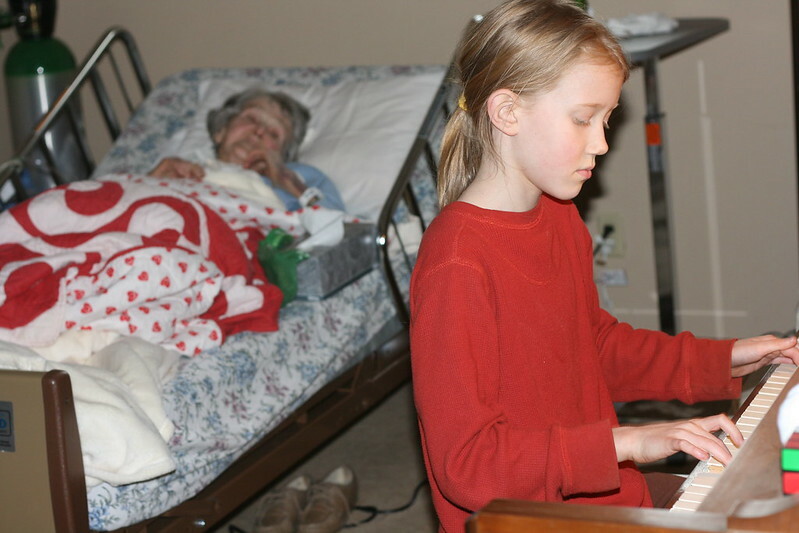 Rachel plays piano for Grandma in her last days. Grandma is clapping her hands. By this time, her short-term memory was so bad, that she often repeated the same question or story within 30 minutes. So I am not sure she remembered that she was dying. My mother-in-law had to remind Grandma Louise that she could not give her water to drink. The water would only go to Grandma’s lungs, causing her to aspirate, making pneumonia and dying in the hospital likely. My mother-in-law could only swab Grandma’s mouth with a wet sponge. Grandma would look confused for a second, then ask, “Is that what the doctor said, Sandy?” “Yes, Mama.” She would then nod her head and let her daughter swab her mouth, trusting her daughter to care for her. Interestingly, though she seemed to keep forgetting this dying business, Grandma remembered that one granddaughter was due to deliver her first child soon. 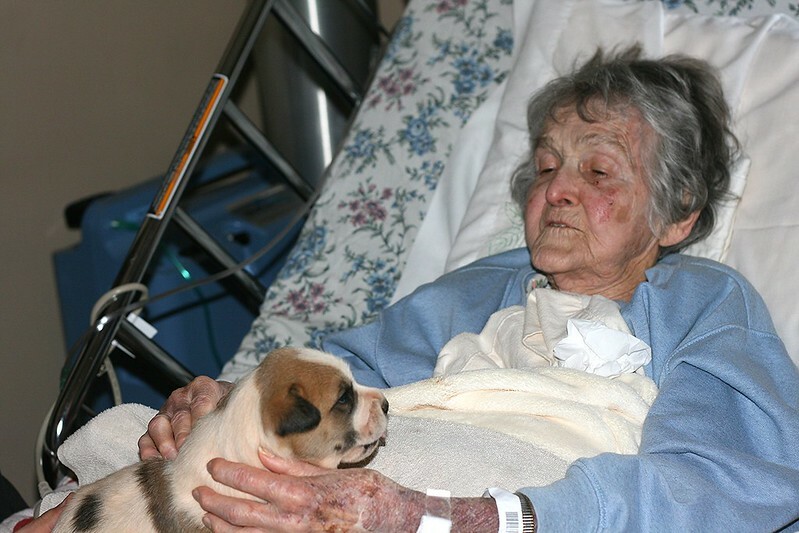 In her last days of life, she continued to ask for news of this most recent great-grandchild. The loss of her short term memory could not make Grandma forget what was important. The day after Grandma came home from the hospital, we all walked through the woods for a visit. She welcomed us into her room with a smile and asked the children to play the piano for her. Grandma loved her music and played almost to the end. And she loved to hear others play for her. Grandma accepted her vulnerability and her need for care, but she did it with a cheerful courage, content to do what little bit she could for the people she loved. That little bit turned out to be a whole lot. Grandma with a puppy the kids carried over for her to see. She clapped her hand with delight. 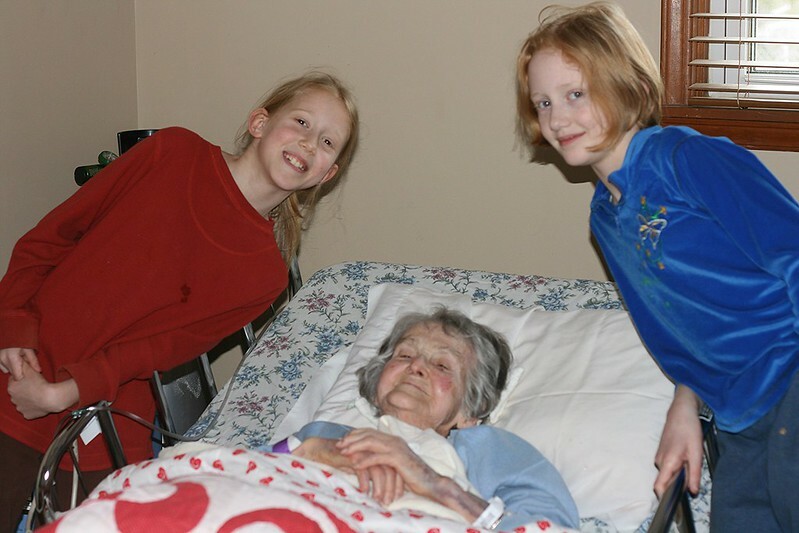 Those last days that we spent with Grandma Louise were sad and joyful, painful and beautiful. One of those days, she reminisced about the time Sid, I and the children drove to Kansas to visit her. We smiled and nodded our heads. Lots of people did come to see her. They traveled from Tokyo, San Francisco, Minnesota, Kansas and Virginia. 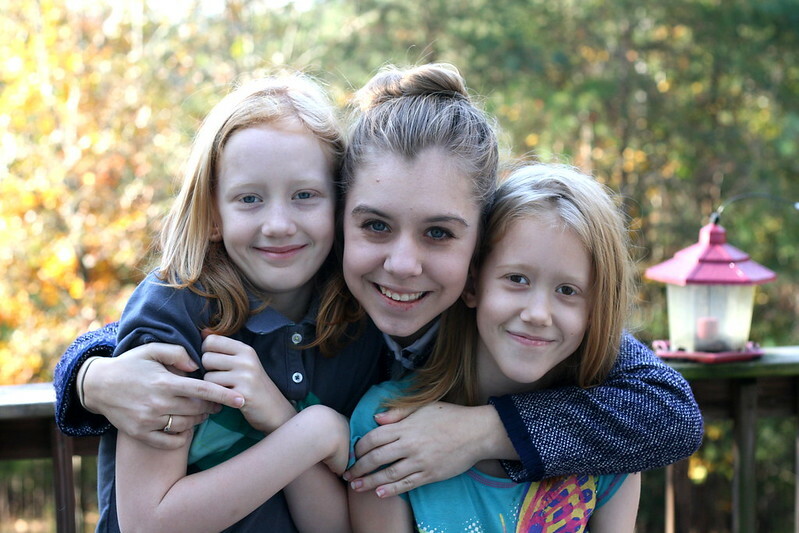 They visited with Grandma and with each other. Lincoln played cello for her and relatives reminisced, hugged, ate, laughed, cleaned, played and cried together. She didn’t think much of herself, but a lot of people still think very much of her. My blog . . . . .I’ve always disliked that word . . . . . . this place where I write — it is my psalm. For years, it has been my refrain —– an intentional, repeated focus on what is good, true, and praiseworthy. And also an expression of hope and trust that there will be more joy on the morrow. At first, it struck me as a novel, and encouraging, thought that perhaps my own psalm could function as my son’s psalm too. 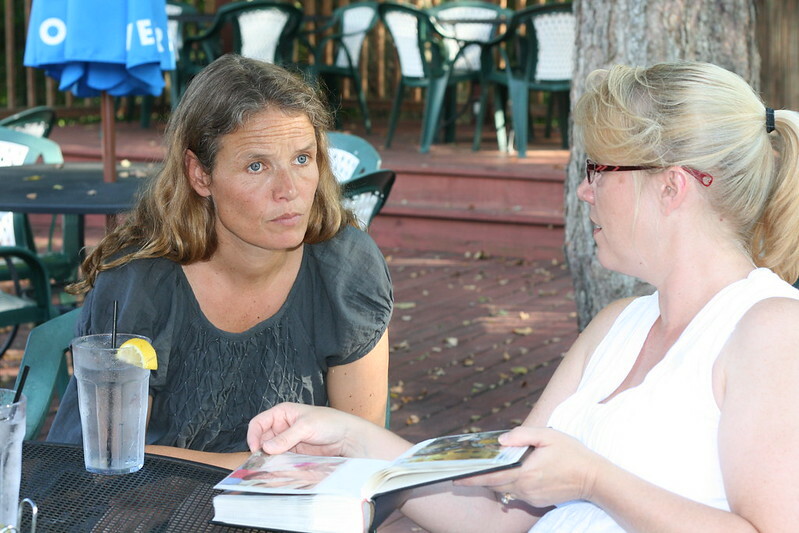 Though further thought proved less surprising — my stories are his stories. They belong to him too. Maybe one day, when he is older and our paths diverge, he will write his own stories, his own psalms. Am I the only person who envisions her life story written on the pages of a novel? Occassionally, I use pretense to motivate myself to do a job I don’t want to do or to inspire a better attitude. Mostly, I see the black stroke of our words against the stark contrast of paper in my mind. This past week, I have taken note of Sid’s words, followed by a bit of context. . . . . . . . . . . . . . . (I don’t remember the context. My brain hinged on the juxtaposition of admire and dreadfully, trying to decipher his intent. I am still working on that one. Sid tells me he was being all literary and referencing Dickens’ Great Expectations).
. . . . . . . . . . . . . ..(I was very sad and tearful, and I *think* he was trying to cheer me up. Pagans should reference Genesis for further clarity). . . . . . . . . . . . . . .(I think he had done something in the kitchen, not quite like I had asked. I do remember biting my lip to keep silent. He must have noticed the lip-biting and thus . . . .the inane comment). I feel inspiration for the kids’ free writes coming on. I could assign them the task of writing down their dialogue occasionally. Or maybe give them a bit of real dialogue with the challenge to frame a story around it. Life is strange. It throws you curve balls, takes you down roads you absolutely do NOT want to walk down. But even along the hard roads, there are good things. Beautiful things. Things we would miss if we were not forced down the tough path. So we made a new friend last week. She lives many states away. If I had been able to choose my path, had I not been forced to suffer some unusual circumstances, I would likely not have met Bethany. That would have been a loss. I am so glad we did not miss out on knowing her.